Young's pub not far north of Moorgate Station. 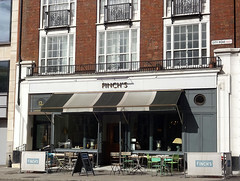 It was previously known as the Master Gunner (see earlier version of this page for more details), but was refurbished and renamed to Finch's in 2014. Today, the pub stretches back a fair way from the street entrance, with the bar along one wall and the rest of the space broken up by pillars and glass-and-metal room dividers. The floor is wooden throughout, and exposed brickwork adds interest. It opens out a bit more towards the back, where large windows let in the natural light that's mostly absent in the other areas of the pub. A square of flooring here is painted in an abstract design which alongside the windows, room dividers, and distressed hoop-backed wooden chairs gives it almost the feel of a summerhouse. In the basement is a bookable function room known as Henry's Den. Kake visited on a Tuesday morning in September 2017. There were just a couple of other customers when I arrived around 9:15am. Music was playing, not too loud. Three of the five handpumps were clipped for Young's Bitter, Young's London Gold, and Belleville Calif-Oregon Amber, with Young's Special and Southwark LPA marked as coming soon. From the breakfast menu, I chose the kale, spinach, and chilli pancakes with bacon and poached eggs (£9.50) photo. The pancakes had a undercooked, gluey texture, and the promised chilli seemed to be entirely absent. The eggs had properly runny yolks, but unfortunately also a rather too high proportion of completely uncooked white. The bacon and watercress were fine. A pot of English breakfast tea arrived weak as requested, with a bite-size piece of chocolate brownie on the edge of the saucer. Accessibility: A ramp to get in, then step-free to bar and seating (the dais that was here in its previous incarnation has been removed). There's a RADAR-locked accessible toilet on the level, with low sink and hand dryer but no grab rails or alarm cord. Last visited by Kake, September 2017. Opening hours taken from Finch's website, September 2017. Last edited 2017-09-06 13:41:26 (version 21; diff). List all versions. Page last edited 2017-09-06 13:41:26 (version 21).